I have a secret to share with you today about two mysterious bags that I have stashed away in my freezer. No, it’s not that! The first is a bag bones… Wait. Leftover chicken bones and beef bones from prior meals, along with onion peels, carrot peelings, parsley bits, and celery ends… Everything that would normally go into the garbage, but can actually be used to make a great bone broth (or stock). I’ve even gone so far to tout it as being “Better Than Botox” and it’s consistently one of the most popular recipes on my blog. Being the good girlfriend that I am, and the non-breakfast chef that I am, I always pick Rick up some granola bars and bananas for his AM “Let’s get this day started” meal. But being the busy guy that he is, he doesn’t always remember to grab aforementioned “Let’s get this day started” meal. Needless to day, I’m quite often left with a bowl of bananas that’s in less than stellar shape. That’s when they go into the freezer. I’ll use them in smoothies: Frozen bananas give a great creamy texture. Banana bread: Those mushy bananas make the best banana bread. No. 2 is the name of the game today – But we’re not just making any banana bread. Nope. Today we’re going full on, taking it to the next level, and overdoing it just a ‘lil bit by making this Salted Caramel Banana Bread with Yogurt. Knock your socks off good banana bread. The most moist and sweet (but not overly sweet) loaf of banana bread that you have ever tasted. My method of attack here? For extra moistness – Greek yogurt. 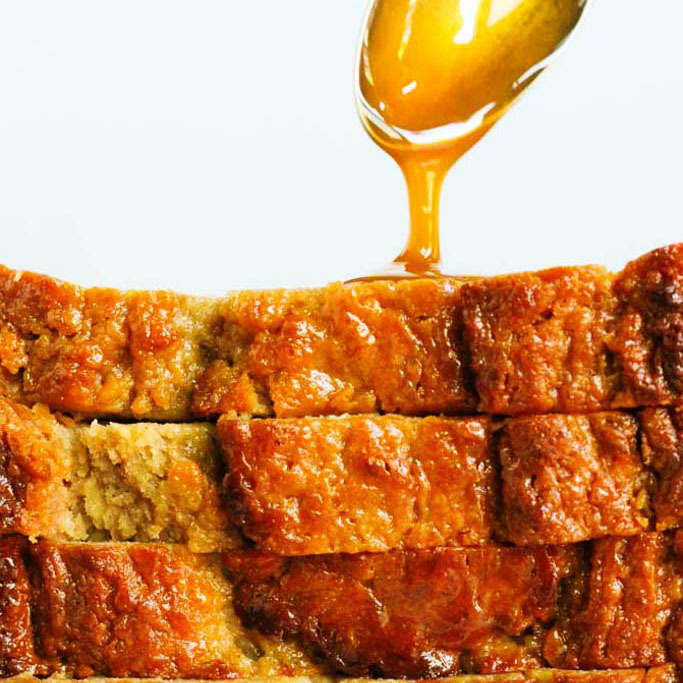 To be sure it’s not too sweet – Only ½ cup of brown sugar. For added flavor – Just a dash of cinnamon. And the kicker – A healthy dose of my 15-Minute Salted Caramel Sauce swirled in. I’ll put that Salted Caramel Sauce on anything that’s justified – For example, these Salted Caramel Apple Tartlets, Pumpkin Pie with Salted Caramel Sauce, Salted Caramel Yogurt Popsicles and Salted Caramel Almond Thumbprint Cookies. I can honestly say that it’s really simple to make the Salted Caramel Sauce, and it only takes about 15 minutes, with ingredients that you probably already have on hand – Sugar, butter, heavy cream and vanilla extract. However, feel free to substitute in some store bought caramel sauce as well. 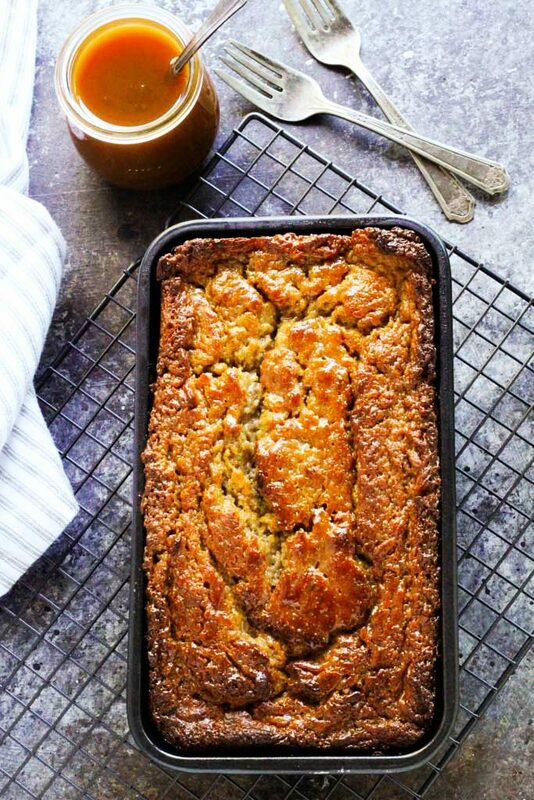 That bag of bananas living in my freezer may just become a thing of the past because I’ll be making this Salted Caramel Banana Bread on the regular – It’s my new obsession. 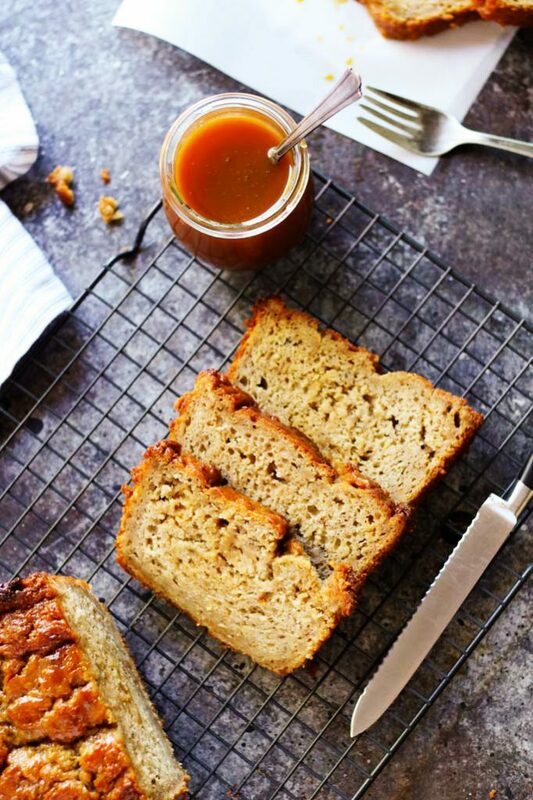 This Salted Caramel Banana Bread with Yogurt is flavorful, moist and not overly sweet - It's the perfect balance of flavors and easy to make at home! Beat butter and sugar in large bowl with mixer until blended. Add eggs and yogurt; mix well. Add bananas and combined dry ingredients; mix just until moistened. Pour into a greased 9x5-inch loaf pan. 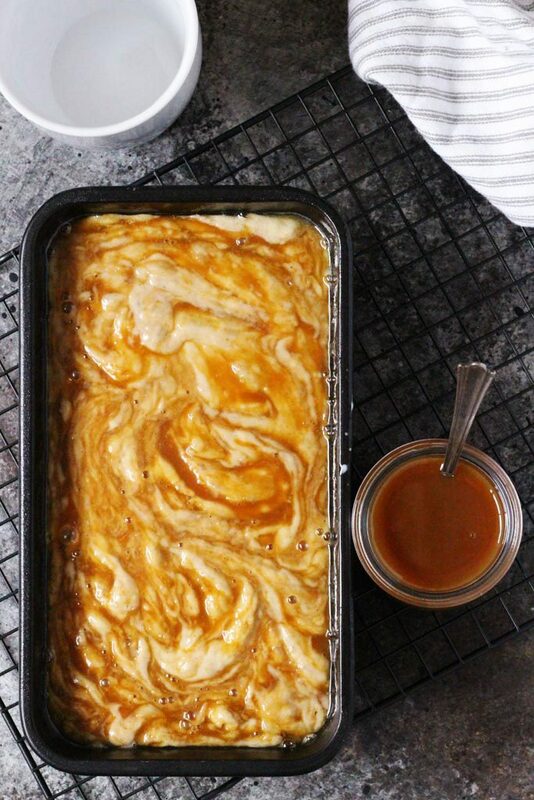 Pour salted caramel on top and swirl into the batter with a butter knife. Bake 1 hour, or until toothpick inserted into middle comes out clean. Let cool. Wow NEXT LEVEL of banana bread is right!! Stop the madness because I can’t take it!!!! Seriously, I make banana bread for my kids all the time (they’re obsessed), but I”m loving the idea of the yogurt to add moisture (mine often comes out dry, which the kids don’t care about but I do). And that salted caramel! Drool!!! I’m wondering how it would come out with whole wheat flour? Usually that would make it really dense, but I’m thinking that yogurt might lighten it up a bit? Perhaps I’ll have to try it and report back to you! You had me as soon as I saw the words Salted Caramel. I don’t love to bake, but I will be making this! PS And I had to smile about your bag of bones. We do the exact same thing. We belong to a chicken CSA, and after we roast our chicken, the carcass either gets made into broth right then and there or it goes into the freezer for later. 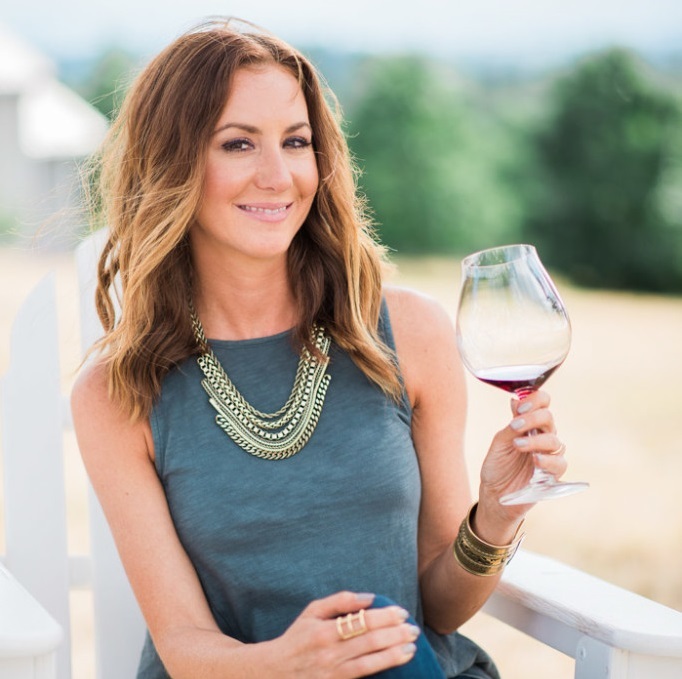 Totally – No need to waste good bones, right Michelle? I am loving this salted caramel sauce idea. 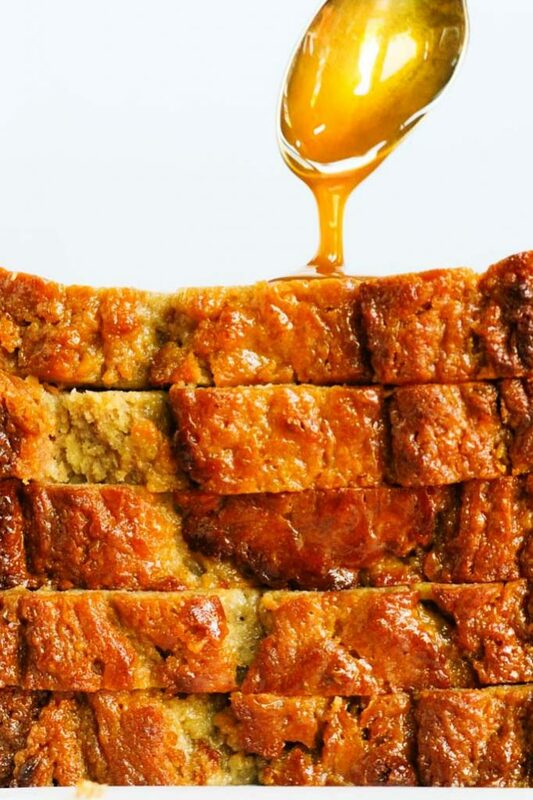 It really takes the banana bread from breakfast to dessert! Wow! I would actually bake for something like this as I don’t really like to bake! Looks and sounds amazing! Thanks so much Carol! I’m not a huge baker either, but this is a really simple recipe that turns out perfect every time! How do you store this bread? I tightly wrap in saran wrap and leave it on the counter. It will last about 3 days.